MyStompz is available for iPhone and iPad. It allows you to recreate the layout of your effects pedals, including start and end angles for each stompbox knob. You can then store your pedal settings and never lose them again. This is the iPad version – Editing knob angles and scales. Several icons appear when you select a rotary or dual rotary knob that was added to the stompbox. They allow for editing the angles of the knob. Tap the first icon on the 2nd row and using the slider you can set the starting point for the knob. This also sets the end point when in Symmetry mode. Tap the 3rd icon to toggle between Symmetry and Asymmetry modes. The drawing on the icon reflects the state the knob is in. 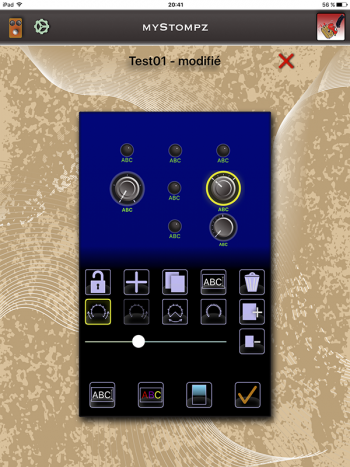 Tap the 4th icon to vary and using the slider you can set the desired number of scales for your knob.